NETWORK FINALS: Game 1 of THE WORLD SERIES adjusted up a full point to 3.9 (a much higher adjustment than 2016’s Game 1, possibly because LA is boosting west coast viewing this year), but that’s still down 1.7 from last year’s first game. 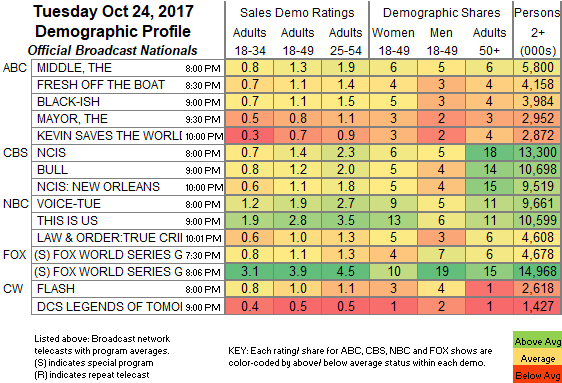 Elsewhere, THIS IS US, FRESH OFF THE BOAT and KEVIN (PROBABLY) SAVES THE WORLD gained 0.1 in final numbers, while LAW & ORDER: TRUE CRIME lost the same. CABLE HIGHLIGHTS: FX’s AMERICAN HORROR STORY: CULT regained the Tuesday cable lead, up 0.06 to 1..03. On USA, WWE SMACKDOWN rose 0.08 to 0.81, CHRISLEY KNOWS BEST gained 0.03 to 0.54, and ACCORDING TO CHRISLEY was steady at 0.27. 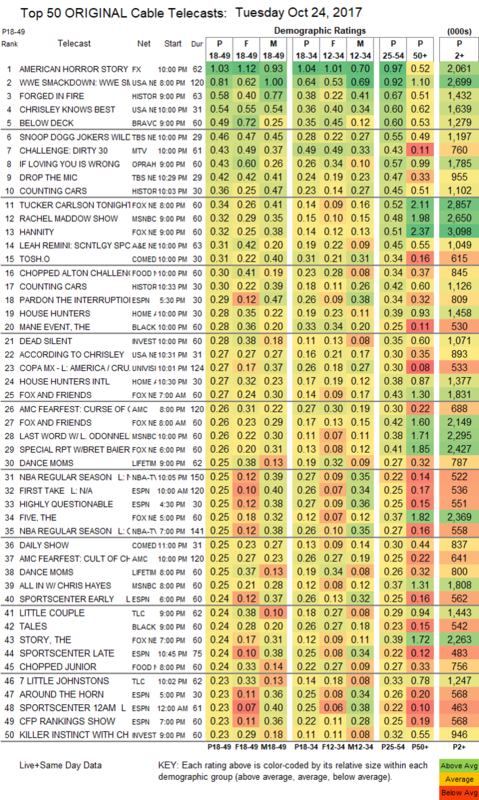 On History, FORGED IN FIRE jumped 0.14 to 0.58, and COUNTING CARS was at 0.36/0.30, compared to last week’s 0.26/0.23. Bravo’s BELOW DECK ticked down to 0.49. MTV’s THE CHALLENGE dipped 0.03 to 0.43. OWN’s IF LOVING YOU IS WRONG ticked down to 0.43. TBS’s pair of new comedies premiered solidly, with JOKER’S WILD at 0.46, and DROP THE MIC at 0.42. Fox News’s TUCKER CARLSON TONIGHT topped cable news at 0.34/0.52/2.9M, over MSNBC’s RACHEL MADDOW SHOW at 0.32/0.48/2.7M, and CNN’s ANDERSON COOPER 360 at 0.21/1M. A&E’s LEAH REMINI: SCIENTOLOGY & THE AFTERMATH lost 0.04 to 0.31. On Comedy Central, TOSH.0 dropped 0.05 to 0.31, and THE JIM JEFFERIES SHOW was down 0.04 to 0.16. On Food Network, CHOPPED climbed 0.06 to 0.30, and CHOPPED JR was up 0.07 to 0.24. HGTV’s HOUSE HUNTERS held at 0.28, and HOUSE HUNTERS INTL was also steady at 0.27. BET’s THE MANE EVENT was crushed, down 0.46 to 0.28, after TALES returned at 0.24. On ID, DEAD SILENT ticked down down to 0.28, and KILLER INSTINCT was up 0.02 to 0.23. On Lifetime, 2 season finale episodes of DANCE MOMS were at 0.25/0.25, compared to last week’s 0.23, and a lead-out special was at 0.15. On TLC, THE LITTLE COUPLE gained 0.03 to 0.24, and 7 LITTLE JOHNSTONS was up 0.03 to 0.23. Spike’s INK MASTERS: ANGELS rose 0.03 to 0.20. On Tru, ADAM RUINS EVERYTHING dropped 0.05 to 0.14, and the premiere of AT HOME WITH AMY SEDARIS followed at 0.07.